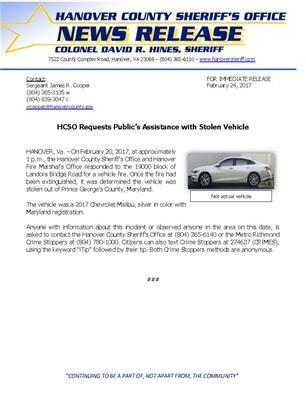 HANOVER, Va. – On February 20, 2017, at approximately 1 p.m., the Hanover County Sheriff’s Office and Hanover Fire Marshal’s Office responded to the 19000 block of Landora Bridge Road for a vehicle fire. Once the fire had been extinguished, it was determined the vehicle was stolen out of Prince George’s County, Maryland. The vehicle was a 2017 Chevrolet Malibu, silver in color with Maryland registration. Anyone with information about this incident or observed anyone in the area on this date, is asked to contact the Hanover County Sheriff’s Office at (804) 365-6140 or the Metro Richmond Crime Stoppers at (804) 780-1000. Citizens can also text Crime Stoppers at 274637 (CRIMES), using the keyword “iTip” followed by their tip. Both Crime Stoppers methods are anonymous.